White Buffalo football improves program, motivated by new league, different challenges. 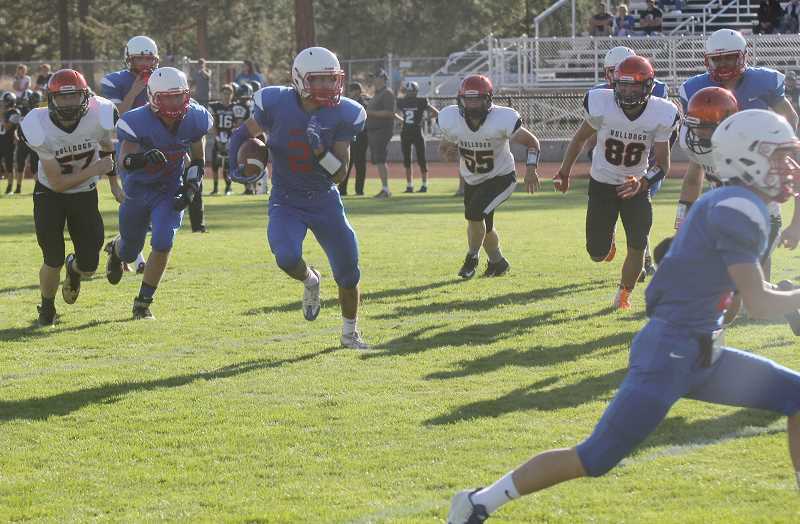 The much improved Madras football program has its goals set high for the upcoming season. The program took giant leaps forward in the 2017 year, breaking a 23-game losing streak. The losing streak that dated back to Sept. 19, 2014, was broken when Madras beat Valley Catholic 19-7 on Sept. 15, 2017. "Our biggest goal is to play to our fullest potential on any given Friday night. We know that we have the talent to be successful, but we must be willing to believe, and have the confidence in our abilities," said head coach Kurt Taylor. "We feel we have potential to compete with anyone we face this year, and if we do play to our full abilities, this could be a very special year." "As far as landmark goals, we definitely want to make it to, and win a playoff game," he said. "We also want to be in the hunt for a league title. I believe this team can achieve those landmark goals, however, to achieve them, we must believe in ourselves, come together as a whole team, and put the past Madras football behaviors behind us." The Buffs also beat Corbett 35-8, capturing the second win of the season. Madras was competitive throughout most of the year, losing close games to both The Dalles and rival Crook County. Madras football will not be in the Tri-Valley Conference this year. They will be in the 3A Special District 1 for the upcoming season. The White Buffalos will play a combination of both 3A and 4A schools. 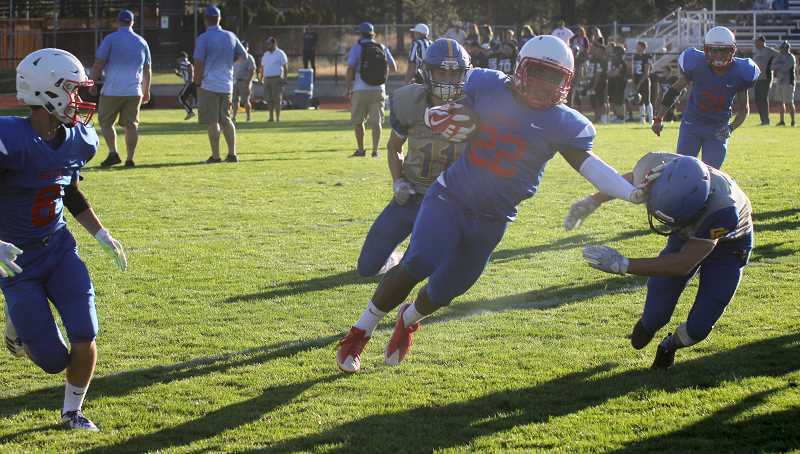 "We have a challenging schedule with some of the best 3A teams in the state in our league (Rainier, Scio, Salem Academy, Blanchet Catholic, Dayton)," Taylor said. "We will treat it just like last year as far each week will be completely focused on that opponent for the week, taking it one game at a time. Each game for us is essentially a playoff game, as we want to compete for a league title and collect a high enough ranking each week. It's also important that our players know that our opponents are very talented. Just because they are 3A doesn't mean we will treat them any differently." Junior Treyvon Easterling had a breakout season last year, rushing for 1,068 yards and 11 touchdowns. The Buffs lost a big senior class, but are not lacking in depth or talent this year. "We lost several key lineman last year. including two all league guys," Taylor said. "We are very young on the OL, but we have size, and they are all very smart kids. We also lost key role players such as Harrison Manu (Playing college football at Snows College) on the defensive line." "Our large role guys this year of course will be Trey, Kobey Jorgensen, and Liam offensively," he said. "They bring leadership and skill. We will have a three headed tandem in the backfield with Trey, Victor Torres, and Wessley Beymer, who all bring different skill sets to the position, but all will be very productive. We also have a lot of depth with our receiving core, and guys like Robert Pacheco, Allen Jackson, Keenan Miller, Dalton Waldow, Nate Stout, and Kobey Jorgensen." Along with star running back Easterling, Culver Transfer Victor Torres has joined the White Buffalos this year. Senior, Torres led the Bulldogs with 1,267 rushing yards, with 11 touchdowns. He also averaged 6.2 yards per carry on 204 rushing attempts. It will be no secret the Buffs will use these two power runners in the bulk of their offense, but will also rely on junior receiver and kick returner Robert Pacheco. The dual threat run, catch, slot receiver led the team with 270 receiving yards. Pacheco also scored four touchdown and had 95 rushing yards. "This team is very well rounded," said Taylor. "We have a ton of junior players who have started to become great leaders for us. We also have several seniors who are continually placing an emphasis on doing the right things, and living up to our core values. We are gaining experience everyday, and it's great to see the boys starting to understand the game a lot better." "In past years we were constantly teaching, and coaching large item football knowledge, such as rules, formations, or general plays," he said. "Now we are getting to breakdown the game more and focus on the small items that make a player better. Overall, the team is more experienced than we have been in years past, but they are also more willing to get better, and learn, and accept coaching as coaching, and not criticism." Taylor will be heading into his third year with MHS and praises this years juniors and seniors. The program leans on their core values, teaching kids how to play the game of football the right way. "We have much more player buy in, as far as our culture, and how we do things," said Taylor. "Players have worked much harder, and we have had an amazing turnout for all off season events. Going to George Fox was huge for us and really began the process of creating a team." The upperclassmen have been coached by Taylor, since they were freshmen and sophomores. They have been through the rise and growth of the program. Learned the playbook and schemes of the coaches. "The third year has allowed the boys to get a full off season, and understand that the coaching staff truly means business when it comes to changing this program around," Taylor said. "The boys are finally starting to see that in order to be a successful football program you must change the behaviors that have happened in the past. We have had a full year and half of getting to instill a work ethic that creates success. The players see that, and they are buying in. We averaged just under 40 players a day in the weight room for summer workouts. We took 40 players to a team camp, and we have almost 85 kids registered to play football." "Our juniors and seniors are setting the tone for this program moving forward," he said. "Not only are the talented, but they understand why we ask certain things of them, and they understand that if they follow our core values, and our process, good things will happen. They are also helping the younger guys understand that there are certain ways to do things, and the program will continually grow because of their leadership. We are excited to see how the season plays out because of their willingness to lead, and buy into our process." Talent does not always been success and success does not always been talent. Athletes and especially high school athletes need to have a strong mental game. Confidence and believing they can win play a huge part in success. "The biggest factor for this team to have success is to become the best teammates possible," said Taylor. "They must believe in themselves, and they must become a band of brothers, trusting in each other. The talent, and skill is there, but if they don't believe in themselves or their teammates than we will not reach our fullest potential. The best part about this team is they are willing to do what it takes and understand that those objectives our a top priority. It should be a really fun year, and we are excited to see how the boys respond." 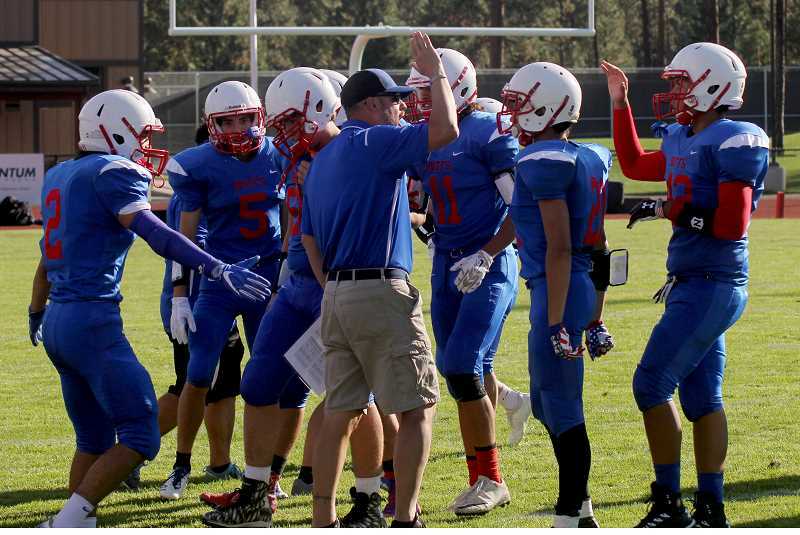 The Madras White Buffalo football program starts the season with a home opener against McLoughlin (MAC High), Friday, Aug. 31 at 7 p.m. MAC High finished the 2017 football season with a 4-4 overall record.